For the glass rim: In a heavy based saucepan, heat the sugar and water until boiling. Use a brush dipped in water to brush the inside of the pot to prevent the sugar from crystallising. Do not stir or allow the brush to touch the sugar mixture. When the sugar syrup has reached a warm caramel colour, add the remaining tablespoon of water, allowing the colour to mix together. Pour the caramel onto a piece of baking paper and allow to harden. Break caramel into pieces, place in a blender and blitz to a coarse powder. Alternatively, place the caramel between two sheets of baking paper and crush with a rolling pin. Sprinkle in to a thin layer on a shallow plate which is large enough to accommodate the rim of the glass. Melt chocolate in the top of a double boiler and pour onto a separate, similar sized shallow plate. Working quickly, before the chocolate sets, dip the rim of the martini glass first into the melted chocolate and then into the crushed caramel. Set aside or place in fridge to harden. 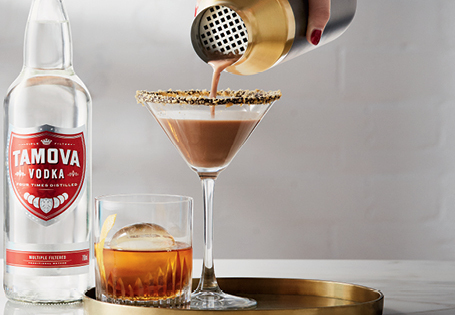 To make the chocolate martini: Place all the Martini ingredients into a cocktail shaker. Shake well and pour into prepared glasses.